A 62-year-old woman presents with headaches and insidious behavioral changes. 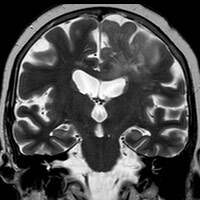 Initial MRI demonstrated an infiltrative T2/FLAIR hyperintense lesion within the left hemisphere with moderate mass effect and extension across the corpus callosum. No appreciable enhancement was present; therefore, the (initial) differential diagnosis primarily suggested a low-grade glioma (LGG). 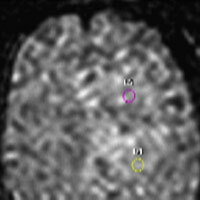 Surgeons consulted in her care believed this lesion had characteristics of a high-grade glioma (HGG), and the “enhancement pattern” was an unreliable predictor of tumor grade. 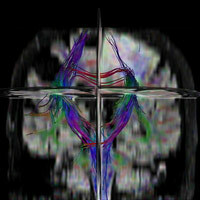 MR perfusion was sought and metrics were calculated in order to guide stereotactic biopsy. Amongst several regions of interest (ROI), the radiation-induced regional cerebral blood volume (rCBV) maximum exceeded 1.75. Stereotactic biopsy was performed; ROI with maximum rCBV value was utilized for tissue acquisition. 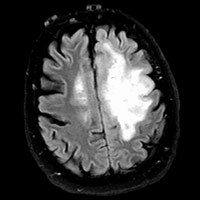 • Perfusion MRI is increasingly being used as a diagnostic and research tool that provides maps of the regional variations in cerebral microvasculature of normal and diseased brains. Our facility uses Philips Healthcare’s proprietary PRESTO sequence to image blood flow of hypervascular tumors at the capillary level. Software includes quantitative metrics and functional maps based on either a curve fit algorithm or a deconvolution of a predefined arterial input function. • Biopsy is still the definitive method to determine tumor type and grade. However, HGG tumors often demonstrate geographic heterogeneity, making it difficult to identify the most malignant region of a tumor and, hence, most ideal biopsy target. • Biopsy guided by conventional imaging—based on integrity of the blood-brain barrier—may not localize the most aggressive component of a lesion. This infiltrative, nonenhancing lesion—initially considered an LGG—was more appropriately treated as an HGG since the rCBVmax was greater than 1.75 (threshold rCBV value of 1.75 to provide sensitivity, specificity, positive predictive value, and negative predictive value of 95%, 57.5%, 87%, and 79.3%, respectively, for identifying HGG). • MR perfusion can assist in creating qualitative rCBV maps, which can be used to target biopsy sites for enhancing and nonenhancing tumors and reduce sampling error and the number of nondiagnostic biopsies. Using the Philips Neuro T2 Perfusion Package, changes in T2 relaxation times are seen as a decrease in signal intensity that is linearly proportional to the local concentration of contrast formulated into a concentration vs. time curve; color maps are then generated. • In summary, neuroimaging is generally considered the surrogate of gross neuropathology; it is not a substitute for tissue diagnosis. 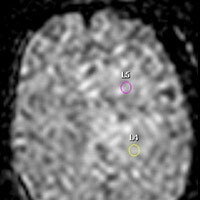 Conversely, it can be a valuable tool for the pathologist or treating physician who aims to formulate a differential diagnosis based on location and imaging features as well as identify radiologic or pathologic discordance, such as the possible undersampling of a heterogenous glioma, which could thereby lead to underestimation of tumor grade. — Rahul V. Pawar, MD, is an attending neuroradiologist at Saint Barnabas Medical Center in Livingston, New Jersey, and a consultant for Philips Healthcare. — Ajay Nemade, MD, is a radiology resident at Saint Barnabas Medical Center. Vincentelli C, Hwang SN, Holder CA, Brat DJ. 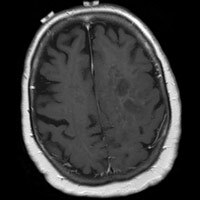 The use of neuroimaging to guide the histologic diagnosis of central nervous system lesions. Adv Anat Pathol. 2012;19(2):97-107.